Americans eat 300 million sandwiches every day. That is, statistically at least, like three out of four Americans eating a sandwich every day. Yes, it is true that the sandwich has been a staple of the American diet since before the great depression. But a lot of variety has been added over the last century. We are way beyond the days of having only two jelly options and peanut butter to spread on bread. The options are so abundant these days that you can have the most gluttonous sandwich imaginable or stick to your diet without cutting them out. Scroll down to learn about ten healthy sandwiches you can eat almost every day. Instead of having a good ole’ fashion bacon, lettuce, and tomato: ask the deli to give you thinly sliced prosciutto instead. Prosciutto has no carbs and way less fat than bacon. Not to mention: it is delicious! For your PLTs, you will need about one ounce of thinly sliced prosciutto per sandwich made. It is almost an undeniable fact that hot sandwiches trump cold ones in taste. Do yourself a favor, buy a sandwich press, and turn your sandwich game up to eleven. To start your path to sandwich greatness, begin with an easy sandwich like the warm prosciutto-stuffed focaccia. Take one round loaf of focaccia, fill it with four ounces of Muenster, one cup of spinach, two tablespoons of light balsamic vinaigrette, and three ounces of prosciutto. 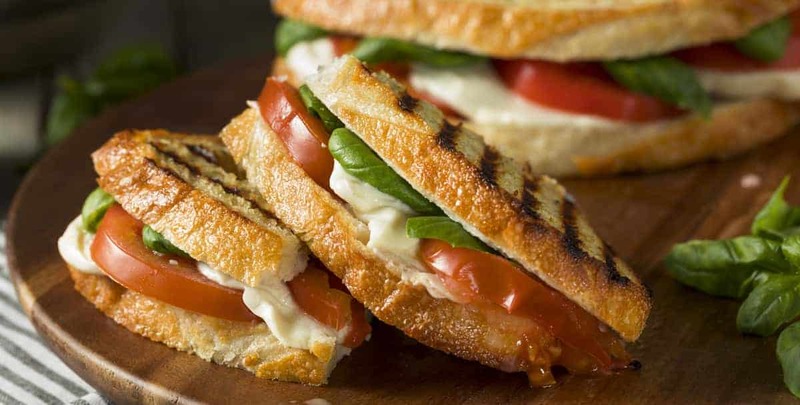 Place on the sandwich press for about a minute (plus or minus depending on how grilled you like yours), and you are on your way to healthy sandwich euphoria. Tuna fish in water is one of the best foods if you are trying to keep track of what you are eating. Tuna has the bonus of being almost pure protein. And at only 150 calories a can, you can put it on a pita, a lettuce wrap, or bread, and it still is not that many calories. Olives and onions are barely any calories themselves, so it can be good to add some in for a bit of texture change and an extra pow of flavor. Do you have a hankering for bread and BBQ? Well, look no further than pulled chicken sandwiches. These are an easy to make option because you can let set the crock pot before you leave for work, and then dinner is ready when you are. If you are looking for a little tang to add to the sweetness, try a few pickles. If you are sick of the same old, same old for lunch: why not pack a wrap instead? Wraps tend to be fewer calories and carbohydrates than bread, and they can add some much-needed lunch variety. Take some sliced up pork, blend it with avocado spread, and maybe a little bit of salsa, and you got yourself a sandwich to satiate you throughout the afternoon. It is time to take out that sandwich press again. This hot and delicious sandwich works for every meal of the day. Just add the three ingredients to an amount you want and press it. A sweet tip: if you are craving more sweetness, try this sandwich on cinnamon-raisin or sweet Hawaiian rolls. Feeling Italian, but trying to stay away from all those pasta carbs to eat healthier? Try this Mediterranean delight to calm those cravings. Eggs are one of nature’s most perfect foods. At about 70 calories each, you can fry them, scramble them, boil them, bake them, and pretty much eat them in any way. If you do not want to let go of eating sandwiches, but you do not know what to put on it, start with eggs. Eggs taste good with a variety of healthy ingredients. Egg sandwiches have a vast sliding scale and can be as healthy, or unhealthy, as you wish. You may think that eggs, bacon, and cheese on your fast food or cafe sandwich are no big deal, but those sandwiches can be a whopping 700-1000 calories each. If you eat a sandwich every morning, don’t panic: there is a solution in your local grocer’s freezer section. All the breakfast bigwigs, from Jimmy Dean to Special K, has made 200-300 calorie sandwich options for you to choose from. They only take about a minute to heat up, and you will save money and calories. Craving peanut butter, but scared to eat all that sugary jelly? Well, nix the jelly and say hello to some bananas! This was one of Elvis’ favorites. Face it; sandwiches are as Americana as baseball and apple pie. They will more than likely always be a part of our diet, which is fine, but make sure that you are adding variety to your diet. A healthy rule of thumb for sandwich toppings is that they should reflect the rainbow in color. Try to stick to foods that are naturally ROYGBV, like fruits and vegetables, and avoid an excess of sauces and cheeses. Healthy sandwiches can only be as healthy as you make them. Trying to eat better every meal and get rid of that dad bod? Click here for some helpful tips.